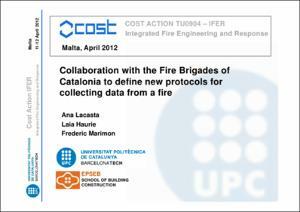 Lacasta, A.M; Haurie, L.; Marimón, F.
Lacasta, A.M; Haurie, L.; Marimón, F. Collaboration with the Fire brigades of Catalonia to define new protocols to collect data from a fire. A: Integrated Fire engineering and Response. "COST IFER - Malta Meeting". Sliema: 2012, p. 1-9.